I wanted to create this post because like me, many people just don’t have all the necessary equipment to create a full blown lab to play around and test things in. Also, I like the ability to be portable and I think its safe to say that a server isn’t the most portable thing in the world. In comes the powerful laptop. At my disposal is a Mid 2015 MacBook Pro with a 2.5 GHz Intel Core i7 with 16GB of DDR3 RAM and a 512GB SSD. 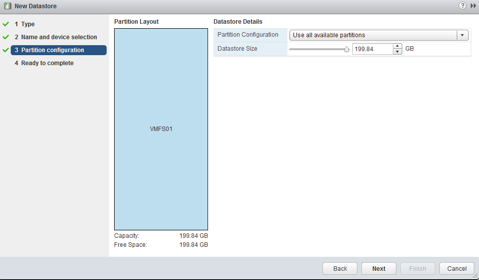 I’m storing all my VMs on an external SanDisk 480GB SSD external drive. 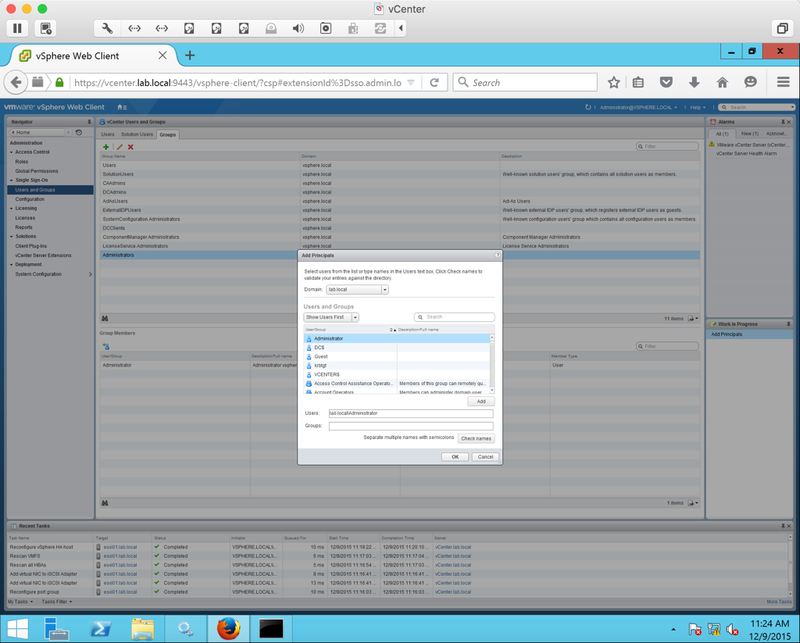 With this, combined with VMware Fusion 8, I am going to show you how to create a vSphere 6 environment. We will also create shared storage so that we can test features like HA and svMotion. Let’s get started. 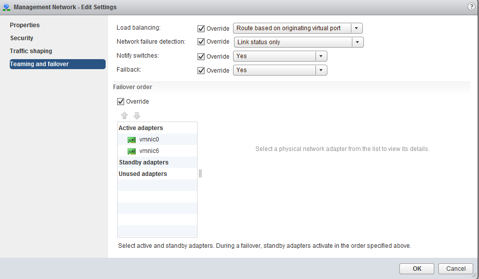 The first thing we want to do is create our different networks for the different vSphere features that we want to use. We will create 5 different subnets for our network, one for each feature. Create a root password . Write this password down because we are going to need it later when we start configuring the host. Press Enter. Our installation is complete. Press Enter to reboot the server and we will begin initial configuration. 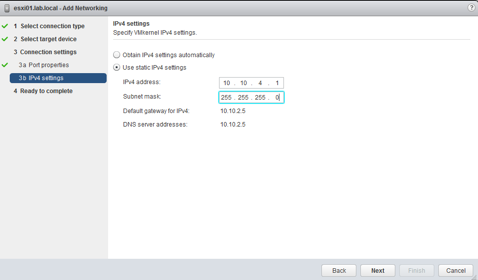 Here, we want to select Set static IPv4 address and network configuration and enter in our IP address. 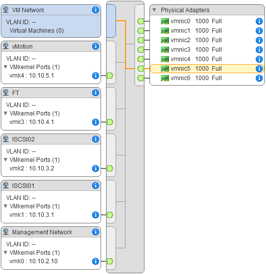 Remember, this is our management network that is on our 10.10.2.0 network. The default gateway in this case is going to be the IP address of our domain controller. We will get to the creation of our domain controller next so for now just take note of the address for the default gateway, as we will assign that same address to the DC. After setting our IP address and pressing enter, let’s change our DNS Hostname. Do this by selecting DNS Configuration from the Configure Management Network menu. Enter in the IP address of the DC for the Primary DNS server and enter in the hostname that you want your host to be identified by. After pressing enter and Esc to return to the main startup screen, we will receive this notice about applying our recent configuration changes. Press Y to accept these changes. 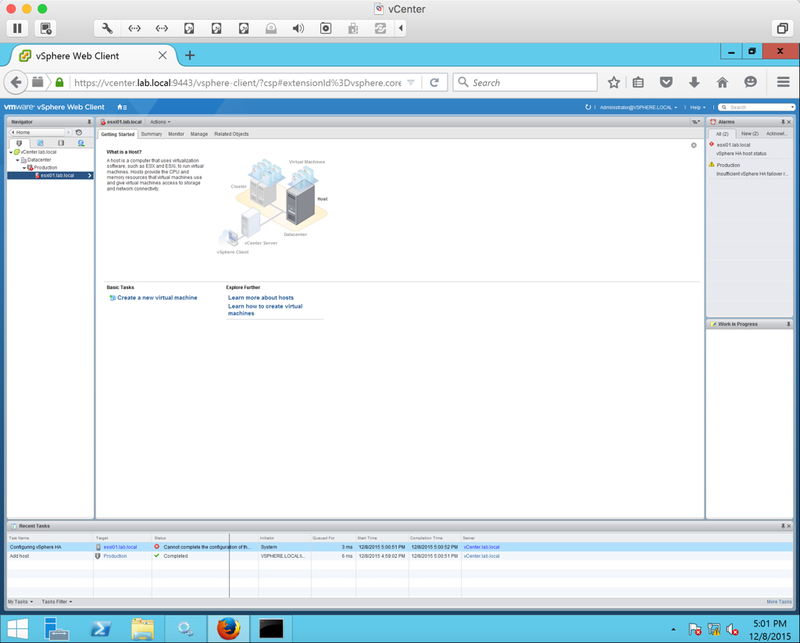 While the restart of our ESXi host is taking place….let’s go and create a Windows 2012 R2 server to be used as our domain controller for our environment. 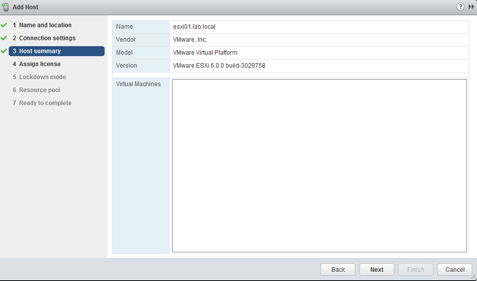 We will also create another 2012 server for our vCenter. Choose Windows Server 2012. Click Continue. Create a new virtual disk. Click Continue. 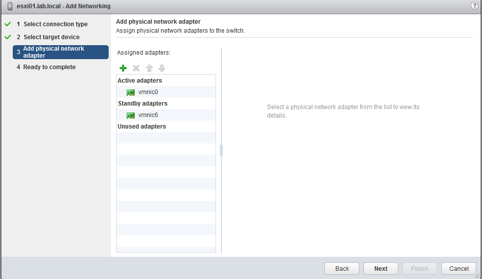 Before we finish up, we need to make a change to the network adapter and make it available on our 10.10.2.0 network. Click Customize Settings. 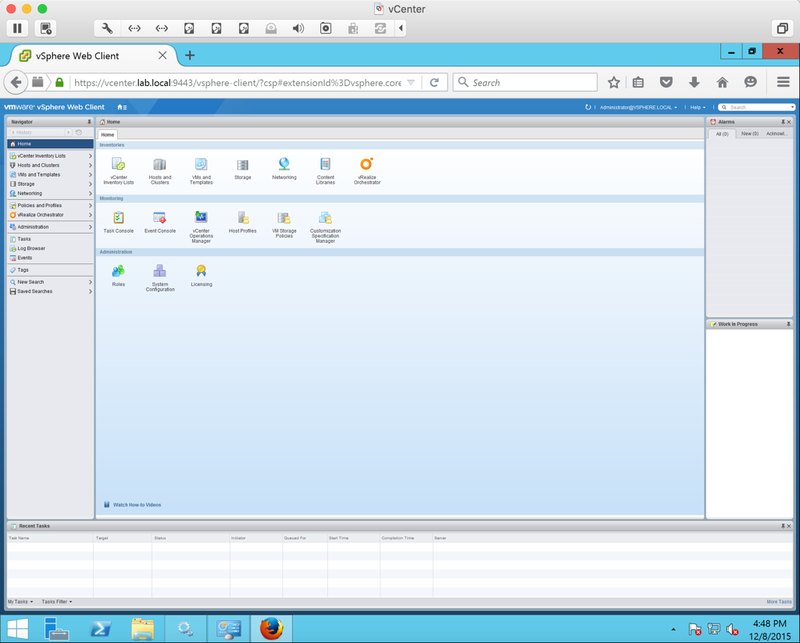 Attach a Windows 2012 R2 ISO to the VM to start the install. Click Next. 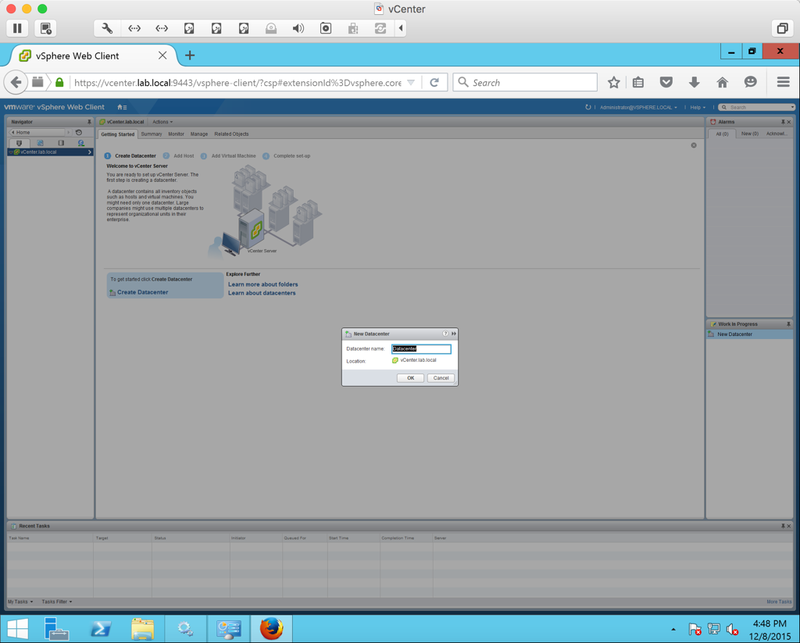 Once the Windows install is complete, the first thing that I like to do is install VMware Tools and save the VM. Now let’s begin making this server into a domain controller. Under Server Manager > Manage select Add Roles and Features. After the install completes, we have some post configuration to do. Click the flag marker at the top of the Server Manager panel to reveal the Promote this server to a domain controller option. 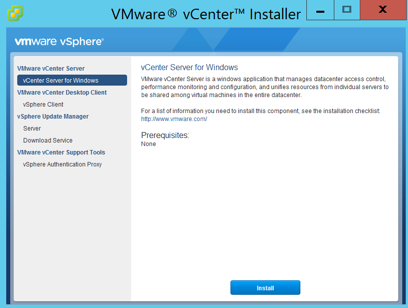 Next, we are going to create our vCenter server. First, create another server just like the one we created for our domain controller except we need to have two processors and 8GB of RAM to meet the system requirements for vCenter to install. 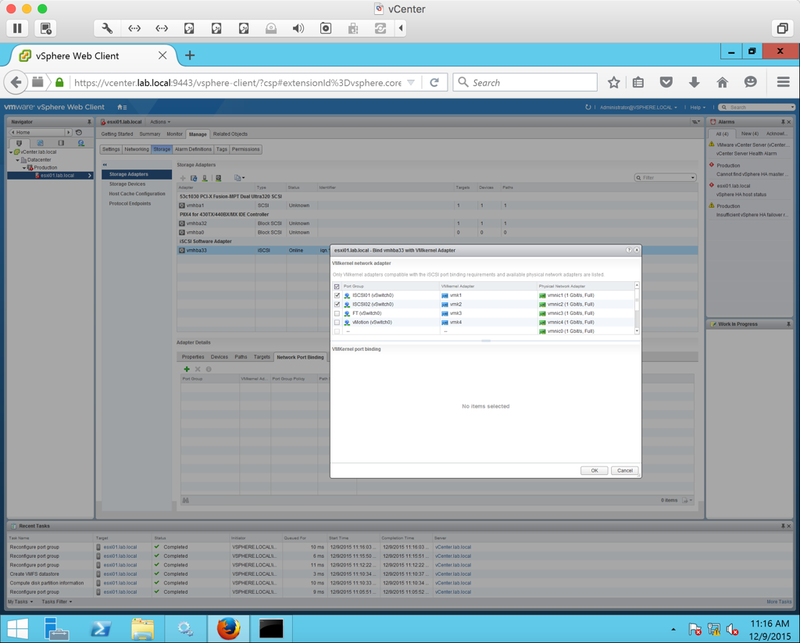 Also, we are going to use our vCenter server to provide shared storage to our ESXi hosts. We will go through that after we install vCenter. 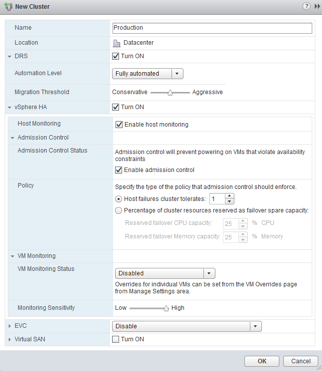 Mount the vCenter ISO. 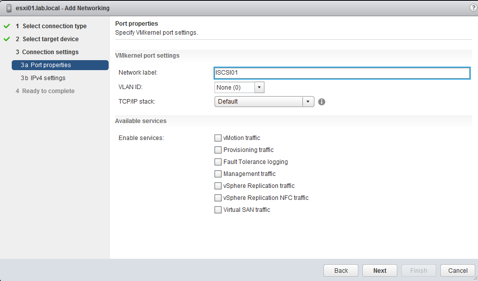 Enter the FQDN or IP of the vCenter server. 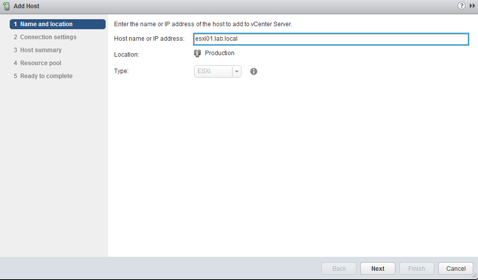 I added a host record in DNS for vCenter.lab.local so that I can enter the name instead of the IP address. Click Next. Enter a SSO domain name and site name to your liking and enter a password for the SSO administrator account. Click Next. Leave everything else as is for the rest of the install and just keep clicking Next. Click Install and get ready to hurry up and wait….and wait….annnnd…yep…wait!!! 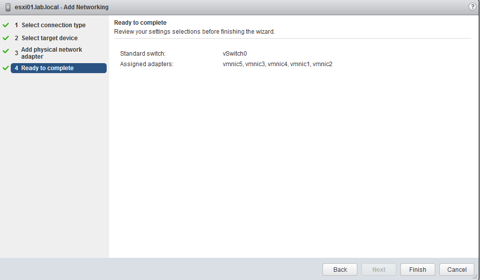 Now let’s being to setup our shared storage for our ESXi. 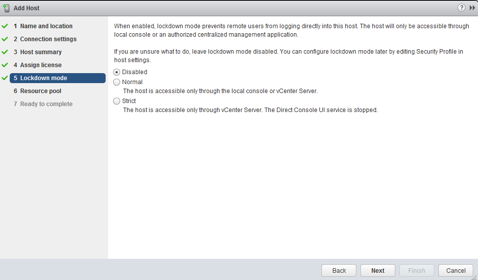 As mentioned earlier, we are going to use the vCenter server to do this. 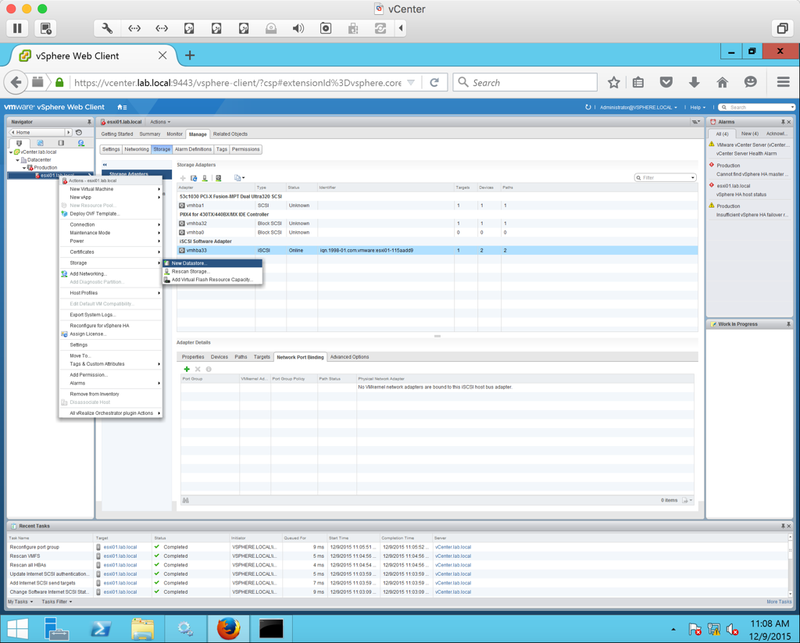 On the vCenter server, go to Server Manager > Manage > Add Roles and Features. Click Next. 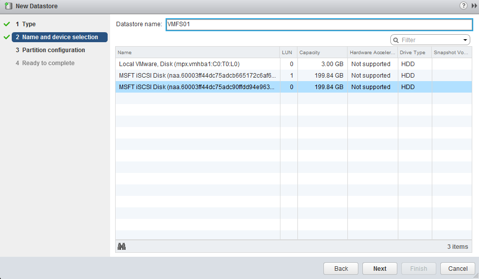 Now we want to add two 200GB disks to our vCenter server to serve as shared storage. In order to conserve space, select Dynamically expanding. This will thin provision the volume and only use the amount of physical storage as we need it. Click Next. Now we need to create our iSCSI targets. These will be the IP addresses for the NICs used for iSCSI on our ESXi hosts. 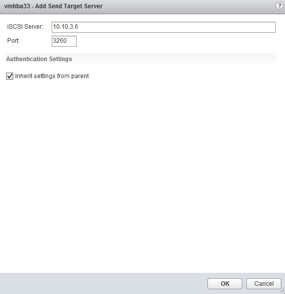 Select New iSCSI target. Click Next. First create a Datacenter by right clicking the vCenter object and selecting New Datacenter. 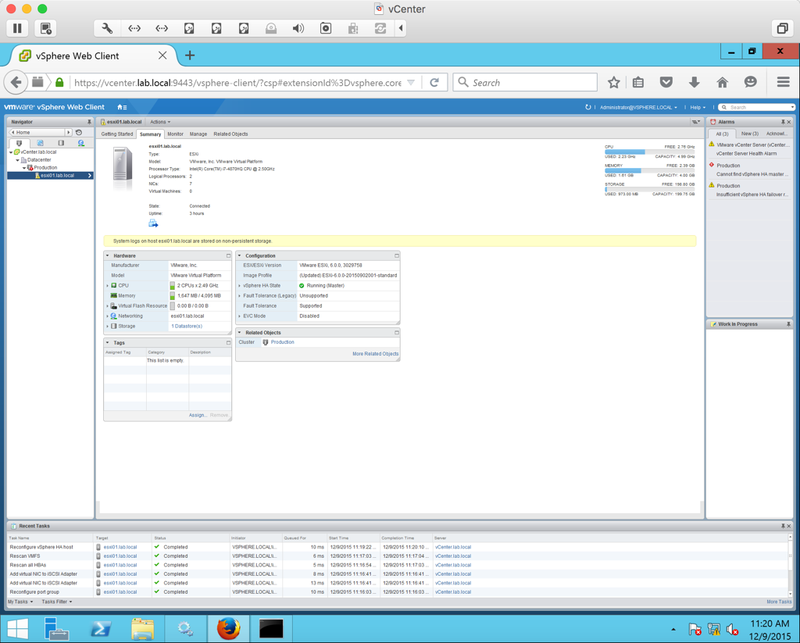 After creating a Datacenter, right click the Datacenter and select New Cluster. Give the cluster a name and turn on HA and DRS by checking the boxes next to the two feature. Now the host will be added to the cluster. 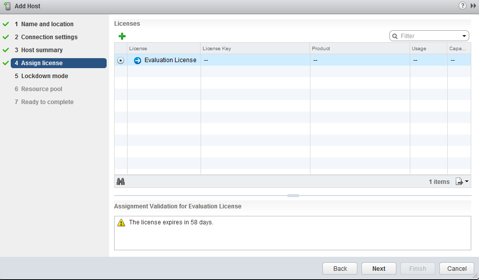 Note that you will get an error about HA not being able to be configured properly. This is because we do not have our NICs configured yet. Notice that we only have one NIC associated with our management network. We need to assign an additional one. We need to go to the console of our host and login to it and add the second management adapter. Login as root and under System Configuration we will go to Configure Management Network. Select Network Adapters. Under Network Adapters we will see vmnic6. 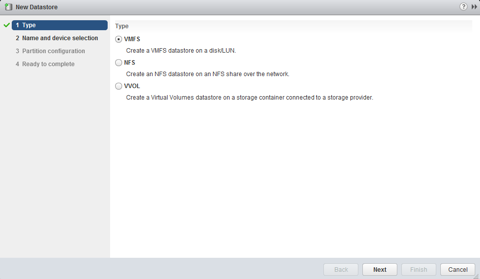 Select that NIC to add it as part of the Management adapters. Press Enter. Click Next and Finish. 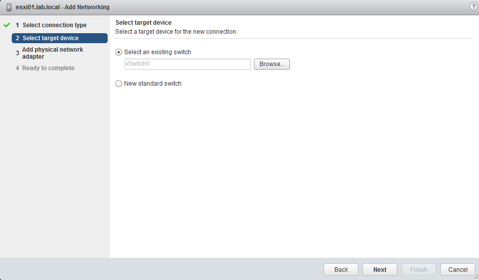 Now Edit the settings of the Management Network port group. 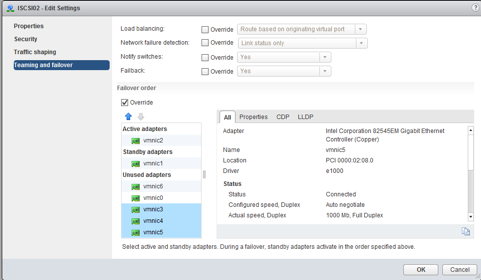 Under Teaming and failover, we want to make both adapters active by selecting vmnic6 and using the arrow to move it under Active adapters. Click Ok.
Let’s add our first VMkernel adapter so that we can add the shared storage to our hosts. Right click the host and select Add Networking. 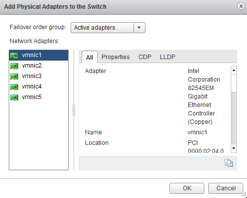 Select VMkernal Network Adapter. 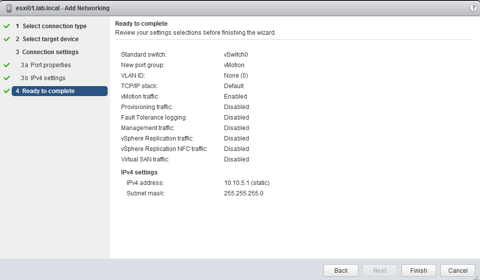 Repeat the same steps again but instead, the NIC that you make active and standby, swap them around. Make vmnic2 active and vmnic1 standby. 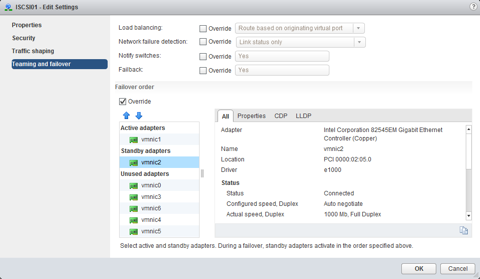 Now let’s create a VMkernal adapter for our Fault Tolerance network. The steps for this are pretty much the same except we need to enable a service, Fault Tolerance logging and the IP address that we assign needs to be apart of the 10.10.4.0 network. 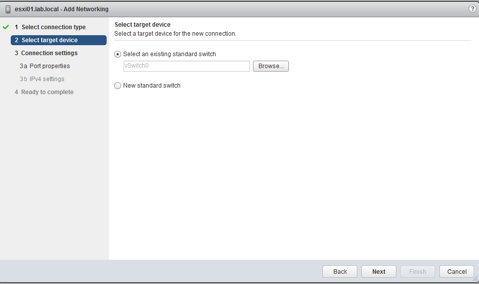 Edit the setting of the FT port group and make only the NIC that is assigned to the 10.10.4.0 network the active adapter. Place all other adapters in the unused adapters section. 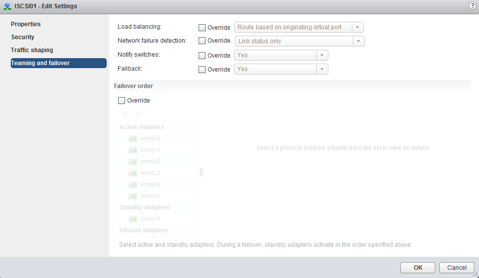 Repeat the same steps for the vMotion network, except the enabled service will be vMotion traffic. Make only the NIC assigned to the 10.10.5.0 network active. Place all other adapters as unused. Go to the newly created software adapter and under Targets enter the IP address that we assigned to the ISCSI NIC on our vCenter server. Create a name for the datastore and select the disk in the selection list below. Click Next. 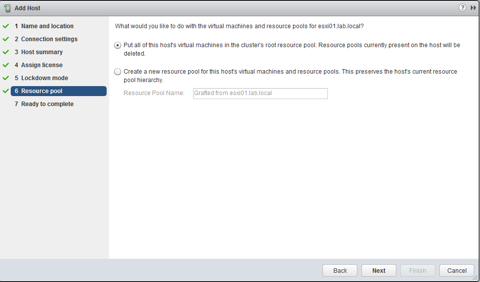 Repeat the same process to add the second 200GB datastore to our host. 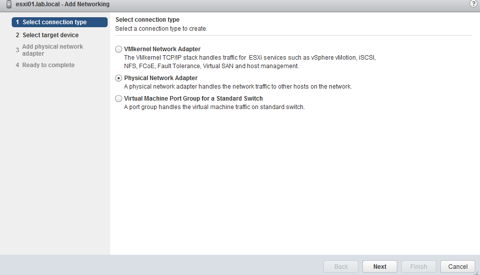 Now we want to create Network Port Bindings so that we can bind the two ISCSI VMkernel port groups (ISCSI01 and ISCSI02) that we created to the software storage adapter. Under the host’s management tab, select Storage >Network Port Binding. Click the green plus symbol. 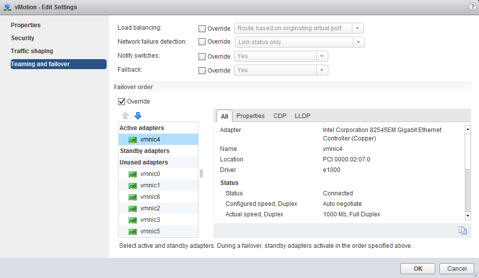 In the list select ISCSI01 and ISCSI02 and click Ok.
We should now see our Network Port Bindings are Active in the Adapter Details panel. We can also check to see how many paths we have available to the storage that we just connect by going under the Paths tab of Adapter Details. After the election takes place, we will see that we are successfully configured for HA. Repeat these sames steps for the second host to add it to vCenter, setup the networking, and add shared storage to it. 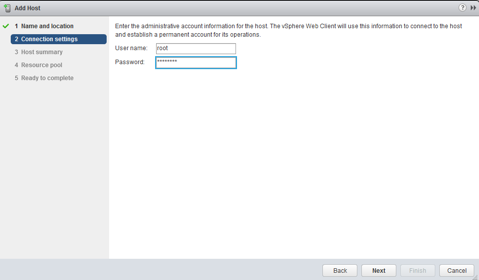 So that we will be able to login to the vSphere web client using our Active Directory credentials, we need to add an Identity Source to Single Sign On. On the main home screen of the web client, click Administration from the menu on the left side of the page. 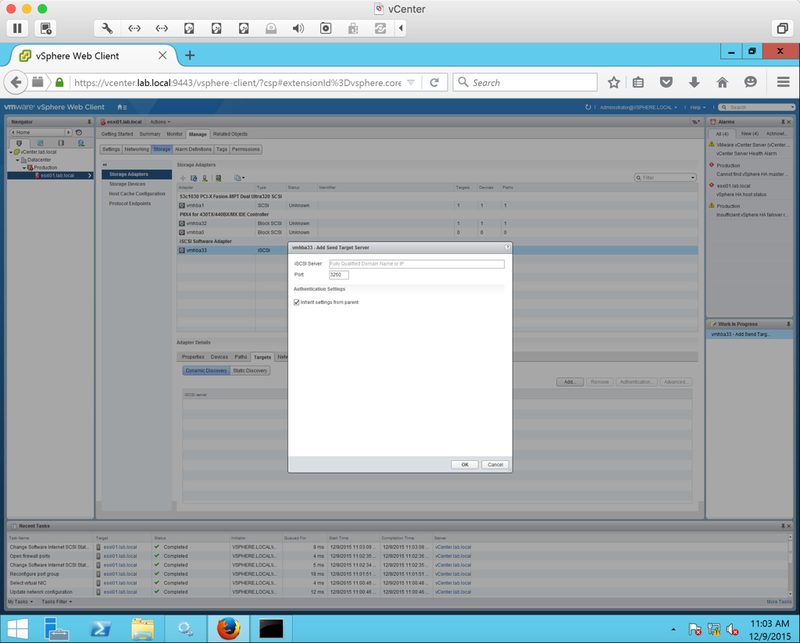 Under Single Sign On select Configuration. 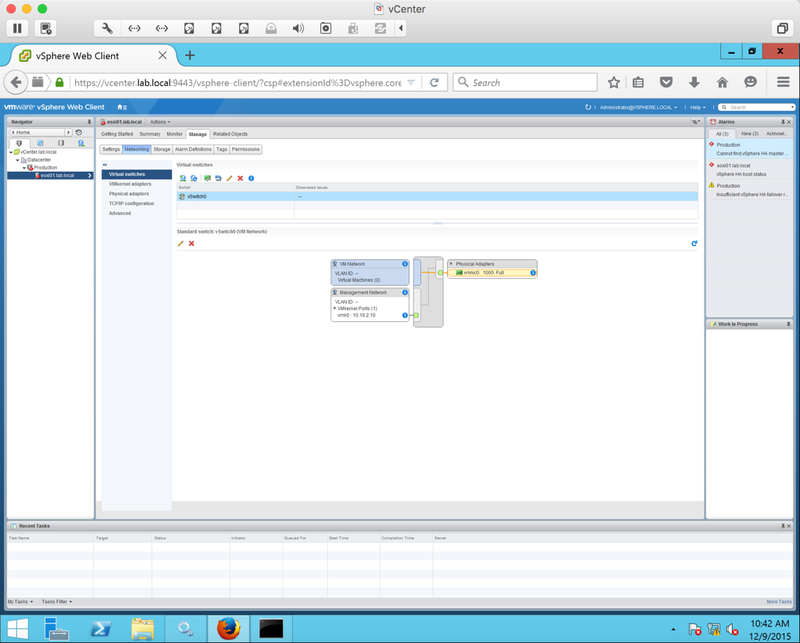 On the SSO Configuration page select the Identity Sources tab at the top of the page. Click the green plus symbol. Select Active Directory (Integrated Windows Authentication). In the Domain name section, enter your domain name. Click Ok.
Now go under Single Sign On > Users and Groups > Groups tab. Select Administrators and add your domain administrator account to it. 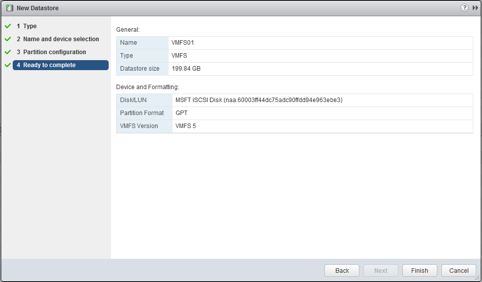 Chestin, how did you configure Fusion to keep VMs on external SSD? During the initial creation of the VM I just saved the VMDK on the external drive attached to my laptop. Good Job C.Hay.. from your experiences on this subject I’m using this as a guide for my special project. Like you I’m using a Macbook Pro for portability (Mid 2012 2.6Ghz Quad i7| 16Gb Ram | 4t raid0) with the goal of using this for my CCNA recertification with the end goal of obtaining CCIE and paired with the virtualization of VMWare Fusion 8.5, ESXi 6.5, VCenter 6.5, GNS3 and Cisco vIRL I’m hoping that those sleepless moments pays off in the end. BTW if you have any performance tweak nuggets you’d like to share I’m all ears…:).. In this test lab scenario, once configured, is it possible to have a VM within the ESXi host communicate with other physical hosts on another network outside of the Fusion environment that the Mac can communicate with? For example.. The Mac is on a traditional /non-vmnet of 10.10.10.0/24 network and can already communicate with 10.10.30.0 , 10.10.40.0 networks. 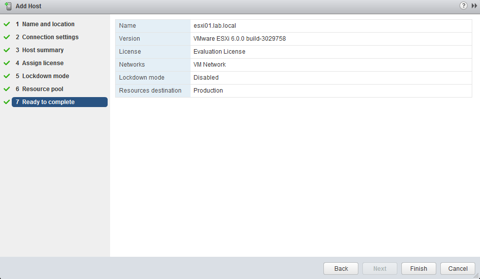 Once this lab environment is created, will the new VM guests on any of the ‘vmnet’ networks be able to communicate with any of the 10.10.30.0 or 10.10.40.0 networks? How could this be configured to make that work?